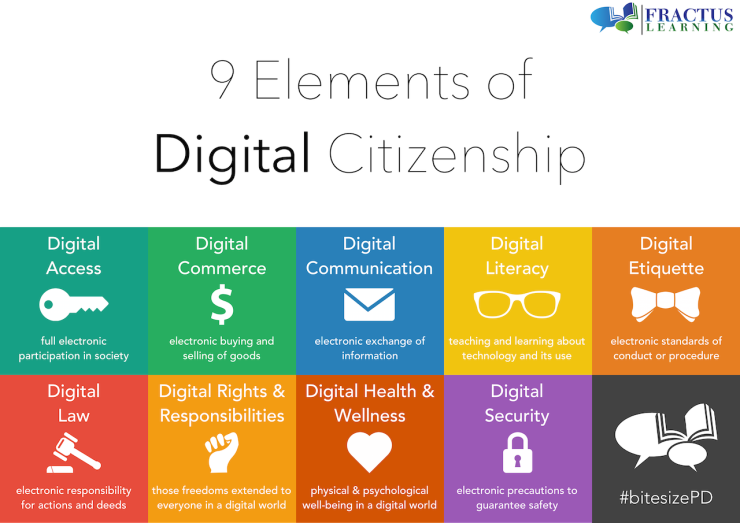 These are suggested resources for MMSD staff members to use with students when teaching about digital citizenship. Common Sense Education - includes units on digital citizenship, K-12. iKeepSafe Digital Citizenship Curriculum - a non-profit alliance with a series of curriculum surrounding digital citizenship for high school students. NetSmartz Educator Resources - Search by age level and topic within digital citizenship to find resources. Digital Access refers to helping to provide and expand access to technology for all users, which should be a goal of all digital citizens. Digital communication is the electronic exchange of information. Communication options are varied. How do we keep our communications with others helpful and appropriate? Digital etiquette refer to standards of conduct or procedures to follow when using electronic resources/tools. Ethics play a part in this. What is considered good manners or bad manners when using technology in different situations? Digital rights are a basic set of rights that should be extended to every digital citizen. You need to know your rights, but also understand your responsibility to be fair and productive as a member of a team. What freedoms should everyone in a digital world have? Digital security is a major concern. As responsible digital citizen we need to respect others people's privacy and safety, but also protect ourselves from those who may cause us harm. What precautions should be taken to keep people (and their private information) safe? Our economy depends a lot on electronic transactions. A buyer or seller needs to be aware of issues associated with electronic commerce. Digital literacy is the process of teaching and learning about technology and how to use it. Digital literacy has become more and more important as electronic devices and resources have expanded at a rapid pace. Which technologies make sense to use in certain situations? How can we discern credible websites from ones that are misleading or fake? Digital law teaches us that we have responsibility for our online action and deeds. What are the rules/laws we need to follow? What are the possible consequences for breaking certain rules/laws? What is ethical vs. unethical behavior when using technology? Digital health & wellness refers to our physical and psychological well-being and how that is affected by technology. Is there such a thing as too much "screen time"? How can technology influence our health?